A lot of you guys keep asking me details about my Linux configuration, so here it is! 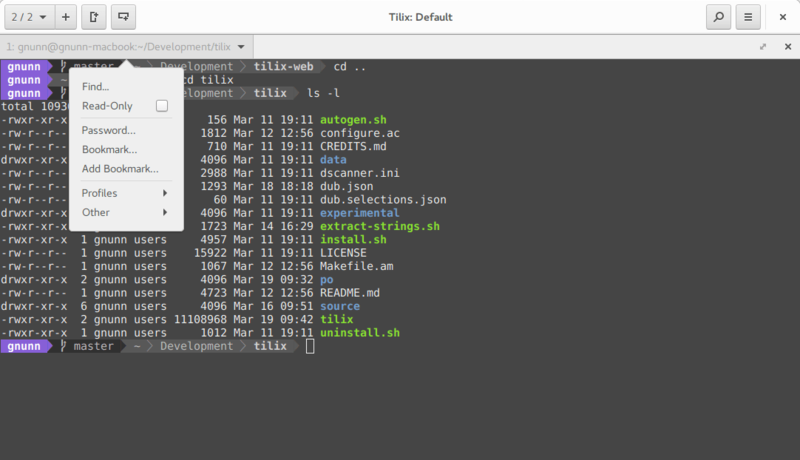 My terminal emulator of choice is Tilix, it’s an advanced terminal emulator written in GTK, and it offers some advanced features like split view. The shell I use is zsh with oh-my-zsh and the powerlevel9k theme on top of it. My terminal editor of choice is vim, although I am not really a vim power user, but I enjoy using some of its less advanced features. The most important configuration files I use are hosted on GitHub, you can find them in this repository. The distribution I use on all of my PCs is Arch Linux, with the GNOME-Shell desktop environment on top. You can find all of them in the GNOME-Shell extensions webpage. My GTK and shell theme is usually Adapta or some fork of it. That’s about it guys, hope you will find this post useful! If you have any request of anything else you want to know, or if you just want to say hi, hit me up on Twitter @GabMus207.